Hannelore Baron practiced an art of concealment and protection. 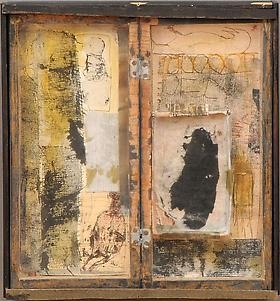 Out of rough and common materials she fashioned constructions, drawings and collages that transmuted the painful experiences of her life into indelible images of the darkness and mystery of being. Baron was born Hannelore Alexander in Dilligen, a small town in the Saar region of Germany in 1926. Her father, Julius, was a Jewish textile merchant, and almost as soon as Hitler came to power, the family began to feel the ominous consequences. Hannelore and her brother were sent to a special school for Jews only. On Kristallnacht, the family’s apartment was ransacked and her father beaten. Thus began a period of flight and border crossing that did not end until the family managed to emigrate from Lisbon to New York in 1941. In the midst of all this, one of Baron’s most vivid memories was that of a brief return to her family’s wrecked apartment, where the bloody handprints of her father were still visible on the walls.